A number of early workhouses were in operation in the area. Luton itself operated one from 1722 — this was the subject of a report in An Account of Several Workhouses..., dated September 17th, 1724. THE Workhouse here is called a House of Maintenance for the Poor, to soften the Appellation of a Workhouse, against which the Poor might be prejudiced. AND there are at present in the House, 10 Men and 10 Women, from 40 to 80 Years old, and 8 Boys, and 13 Girls, from 3 to 12 Years old, making in all 41. These being very old and infirm, or very young and helpless, you must think, little is to be expected from their Labour, where Nursing is chief Business of the House: And yet there are few of them, but what do bend their Hands to the little Employment they are put to, which is platting of Wheat-Straws; this being a very fine Country for the Product of that Grain, affords a very beautiful Straw, which is therefore pitch'd upon as the properest Manufacture to employ the Poor in; and the Farmers are thereby encouraged to draw the finest Straws, and cut off the Beards before the Wheat is thresh'd, which they make up into Bundles as large as a Wheat-Sheaf, and fell to the House for 4d. a Bundle. A very skilful Woman, who is a Dependant upon the Parish, instructs the rest to do their Work well, and make no waste. Of the worst Work they make ordinary Hats and Bonnets, and of the best Work, they make very good Hats, which may be sold there for 3s. a piece, but at London would be worth near double the Money : And with good Management, out of one Bundle, 3 Hats may be made. THE House is an old commodious Building, hired by the Parish for 9l. per Annum, and will accommodate about 80 Persons very well; here they are lodged and dieted in a clean, wholesome Manner; some of the Furniture being found by the People that come into the House ; and the rest at the Charge of the Parish. THIS being a great Malt Country, they buy very good Table Beer for 2s. 6d. a small Cask of 25 Gallons each; and as to Flower, Bread, Roots, and other Articles, their Bill of Fare is much the same as in other Workhouses. THE Year's Charge from Easter 1723, to Easter 1724, for the Poor, on all Accounts, amounts to no more than 209l. 15s. 2d. whereas the last 8 Years before, one Year with another, was 667l. 7s. 2d. ½. By 1775 the Luton workhouse was able to house up to 80 inmates. Dunstable had a poorhouse from the very early date of 1592, located on the High Street at the north side of the Swan Inn (Page, 1912). In 1775 it could house up to 20 inmates. In 1795, the poor in Dunstable were "farmed" by a contractor who in 1795 received 3s.6d. a week for each pauper maintained in the workhouse. At the time of its closure in 1836, the workhouse had 42 inmates. A workhouse operated at Caddington from 1725 (Emmison, 1933). A parliamentary report of 1777 recorded further workhouses in operation in Eaton Bray and Houghton Regis, both capable of housing up to 20 inmates. According to an estate map of 1762, the Houghton Regis workhouse was located at the south side of the churchyard. A report on the Sundon parish workhouse in 1718 revealed it to be in a filthy condition Page, 1908). The well was full of dirt, and it was "necessary forthwith" to provide eight bedsteads, eight beds, sixteen blankets, two pairs of sheets to each bed, and eight rugs. County of Bedford: Barton in the Clay, Caddington — part of, Dunstable (2), Eaton Bray (until 1845), Houghton Regis (2), Humbershoe, Luton (5), Streatley with Sharpenhoe, Studham — part of, Sundon, Totternhoe, Whipsnade. County of Hertford: Caddington — part of (2), Kensworth, Studham — part of. Later Additions (all from 1896): Hyde, Leagrave, Limbury, Stopsley,. The population falling within the Union at the 1831 census had been 15,483 with parishes ranging in size from from Whipsnade (population 204) to Luton itself (5,683). The average annual poor-rate expenditure for the period 1831-34 had been £9,016 or 11s.8d. per head of the population. At its first meeting, the Board elected the Marquis of Bute as its Chairman. Lord Bute donated a piece of land on which to erect a new workhouse at the west side of Dunstable Road. The Poor Law Commissioners authorised an expenditure of £4,655 on construction of the building which opened in 1836 and was to accommodate up to 300 inmates. The building, designed by John Williams, had an unusual plan which combined elements of two other popular layouts — Sampson Kempthorne's square plan and the courtyard plan devised by Sir Francis Head. The original structure had a courtyard-style outer perimeter of two-storeyed accommodation ranges, rooms in the upper storey being accessed by cast-iron galleries attached to the inner sides. The centre of entrance block on Dunstable Road formed the eastern side of a quadrangle and contained the Guardians' board room, offices etc. Males were accommodated at the north side of the workhouse, and females at the south. The site location and layout are shown on the 1901 map below. Luton workhouse site layout, 1901. Luton general view from the east, 2000. Luton entrance from the east, 2000. The internal courtyard had a central three-storey hub containing the rectangular dining-hall, and from which radiated three "spokes". One spoke contained the kitchen and washhouse, and another the schoolroom and laundry. The octagonal upper two floors of the hub contained the Master's quarters and had a good view of all parts of the workhouse. Luton central hub from the south-west, 2000. An early infirmary block, dating from before 1879, stood at the west end of the northern range. 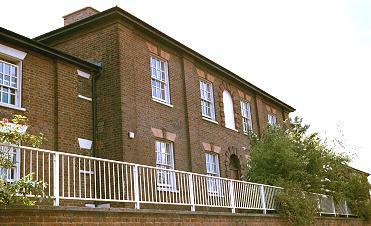 In 1909-12 a series of additions was made to the workhouse designed by Gotsch and Saunders. The new buildings included an aged men's block at the south-west of the site in 1909, a nurses' home in 1911, and a large infirmary was at the north of the workhouse in 1912 costing £6,000. Other buildings included a mortuary and nurses' home. A lodge and casual wards were added at the north-west of the site. 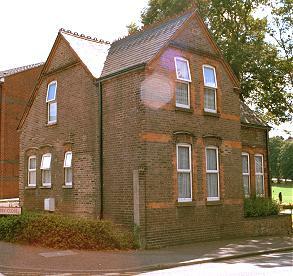 Luton workhouse lodge from the north, 2000. The later layout of the buildings is shown on the 1924 map by which time the workhouse was officially known as a Poor Law Institution. The workhouse site later became St Mary's Hospital. 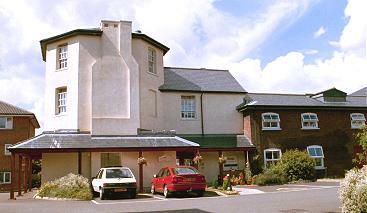 The surviving buildings, very much altered, are now used as a residential care home for the elderly. In the early 1900s, the Luton Guardians opened a cottage home for pauper children known as the Beech Hill Homes, on Dunstable Road, Luton. The building no longer exists. Bedfordshire and Luton Archives and Records Service, Borough Hall, Cauldwell Street, Bedford. MK42 9AP. A wide variety of records survive including: Guardians' minute books (1835-1930 with gaps); Admissions and discharges (1916-34); Birth registers (1866-1949); Death registers (1866-1951); Creed registers (1876-1949); Punishment books (1909-52); etc.